MHS (Mynydd Hir Stud, L.L.C.) is a top provider of champion Welsh Cobs - the remarkable horse from Wales. Our ranch spans over a hundred plus acres of pristine Colorado mountains and valleys. 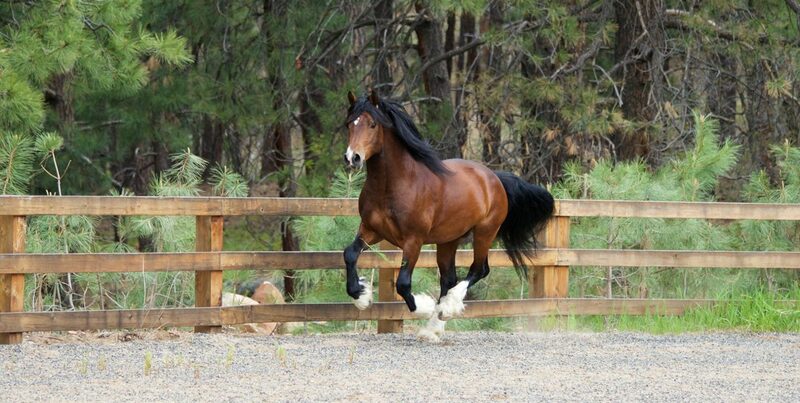 Since 1994, we’ve been setting a high standard for the Welsh Cob in the US. With our imported stud and mares, and now our home-bred cobs, we are dedicated to champion quality horses and ponies in this highly versatile breed, who can perform and excel when shown in-hand, and in sporting, dressage, and driving. Our champion Welsh Cobs, Minyffordd Megastar, Trefaes Belladonna, Mynydd Hir Starbucks, and Teifi Judy Jazz, have won many American National Supreme and Welsh Cob Championships in-hand. They’ve won numerous ridden championships, and for Megastar, many driving and trail championships. Their offspring, along with Megastar’s offspring from lovely imported mares in our herd and mares across the nation have been a major factor in establishing the standard of Welsh Cobs in America to the highest level, rivaling even that of Wales. MHS is committed to producing historically correct cobs that are athletic, intelligent, friendly, strong, and versatile; the honest-to-goodness, do-it-all pony/horse. A great deal of training is needed to foster a successful sport horse, so start out with the best breed for your riding passion. The Welsh Cob is a perfect breed for professional riders and new riders alike. MHS boasts huge open pastures for our champion horses. We make our priority the physical and mental health of our herd. The Welsh Cobs were birthed and evolved from the Section A Welsh Mountain Pony. In the 18th and 19th centuries, outcrosses to Norfolk Roadsters, Hackneys, Arabians, some English Shires, and possibly others resulted in the modern Cob. Cobs were employed as riding horses for the British Cavalry, reliable mounts for traveling doctors, farmers, and other working people, as well as carriage, cart, cab, and wagon animals in the cities. Smaller mounts for youth and adult competitors in sporting competitions that range from jumping to harness racing. Welsh Cob is athletic and manageable for smaller riders. Welsh Cob are a perfect mount for dressage training and smaller dressage riders. They are easy to handle and are highly athletic, hearty, and substantive. The Welsh Cob has been bred for its courage, tractability, and power of endurance. We breed the highest standard of Welsh Cob for the best examples of the breed.
" I purchased the lovely Sec D buckskin filly, that everyone was drooling over when Bonnie posted her baby pictures! MHS Aurora took the long trip to Massachusetts in style, Welsh Cob style that is. She arrived totally calm and happy, due to her confidence, and calm temperament. She had a great childhood. She is now a lovely young mare. MHS Aurora is everything I could hope for in a Welsh Cob mare. I can't wait to start driving her." Having raised Welsh Ponies and Cobs for 30 years in South Africa, I knew exactly what type of Cob I was looking for when I moved to the US three years ago. I wanted the whole package!! True to type Welsh character, good temperament and drop dead gorgeous looks. This was not that easy to find until I found MHS Cobs in Durango, Colorado. After traveling 3000 miles to Raleigh, North Carolina, my 3 black beauties finally arrived. Easter Lily, Odyssey and Knight Star. They are all I could ever have hoped for. Their temperaments are amazing and obviously have been well loved and well handled. Thank you to Todd and Bonnie! It has an absolute pleasure doing business with you and a privilege now to call you friends.